Most users rely on the PureCloud controls for using their phone. Note: This article applies to PureCloud for Chrome, PureCloud for Firefox, and PureCloud for Salesforce. You can configure the client either to make a call directly or to make a call on behalf of a queue when you click phone numbers that are tel:links (PureCloud for Chrome and PureCloud for Firefox) or phone numbers in Salesforce (PureCloud for Salesforce). This configuration persists until you change it. Note: Interaction Log does not appear in the client menu for PureCloud for Chrome or PureCloud for Firefox. Queue Activation only appears in the menu if your administrator has given you access. 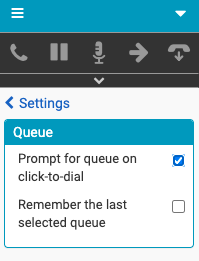 To make calls on behalf of a queue, select the Prompt for queue on click-to-dial check box. Tip: If you want to make all calls on behalf of the same queue, then before making your first call, select the Remember the last selected queue check box. For more information, see Configure on behalf of queue. To make calls directly, clear the Prompt for queue on click-to-dial check box. Note: Not all sections or options under Settings are available in all versions of the client or for all agents. For more information, see Click-to-dial and click-to-email, Make a call, Configure on behalf of queue, Turn off click-to-dial and click-to-email, Settings in the client menu, and Create click-to-dial on custom Visualforce pages. For more information about the integrations, see About the PureCloud browser extensions and About PureCloud for Salesforce.